Psoriasis is characterized by chronic inflammation and painful skin legions. Epidermal dysfunction is an inherent feature of psoriasis; however, it is not clear how interactions between epidermal and immune signaling pathways lead to disease development. Mårten C.G. Winge and colleagues at Stanford University School of Medicine provide evidence that aberrant epidermal RAC1 signaling is a key player in psoriasis. In primary psoriatic human keratinocytes (PHKCs), exposure to exogenous psoriasis stimuli resulted in striking RAC1 hyperactivation. Expression of a constitutively active RAC1 mutant in the epidermis of mice promoted development of pronounced skin lesions, analogous to those seen in human psoriasis patients. Moreover, lesional skin in these animals exhibited an elevated inflammatory response that was similar to that observed in patient lesions. Development of psoriasis-like symptoms required a full immune system, as immunodeficient animals did not develop lesions in response to constitutive RAC1 activation. Additionally, PHKC xenografts only promoted disease in immunodeficient mice after the injection of immune cells from WT animals. The authors determined that RAC1 acts on transcription factors, including STAT3 and NFκB. Specifically RAC1-mediated STAT3 activation allowed for the proliferation of keratinocytes in psoriatic epidermis, and RAC1 interaction with the psoriasis-associated NFκB activator CARD14 increased cytokine production. Together, the results of this study show that epidermal RAC1 signaling regulates psoriasis pathogenesis and immune response via the promotion of an epidermal-immune feedback loop. Furthermore, this study suggests that RAC1 should be further explored as a potential therapeutic target for psoriasis. The accompanying image shows psoriasis xenografts on immunodeficient mice (top row) and immunodeficient mice that received autologous peripheral blood mononuclear cells (PBMCs) (bottom row). Right panels stained with desmoglein 3 (red), proliferation marker Ki67 (green), and DAPI (blue). Left panels stained for RAC1GTP (green) and DNA (blue). Note that RAC1 activation and proliferation associated with psoriasis only occur in animals that also received immune cells. Citation Information: J Clin Invest. 2016;126(7):2661-2677. https://doi.org/10.1172/JCI85738. 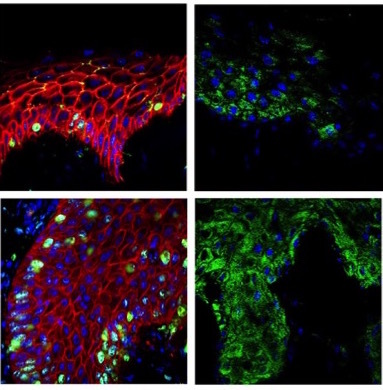 Interactions between the epidermis and the immune system govern epidermal tissue homeostasis. These epidermis-immune interactions are altered in the inflammatory disease psoriasis; however, the pathways that underlie this aberrant immune response are not well understood. Here, we determined that Ras-related C3 botulinum toxin substrate 1 (RAC1) is a key mediator of epidermal dysfunction. RAC1 activation was consistently elevated in psoriatic epidermis and primary psoriatic human keratinocytes (PHKCs) exposed to psoriasis-related stimuli, but not in skin from patients with basal or squamous cell carcinoma. Expression of a constitutively active form of RAC1 (RACV12) in mice resulted in the development of lesions similar to those of human psoriasis that required the presence of an intact immune system. RAC1V12-expressing mice and human psoriatic skin showed similar RAC1-dependent signaling as well as transcriptional overlap of differentially expressed epidermal and immune pathways. Coculture of PHKCs with immunocytes resulted in the upregulation of RAC1-dependent proinflammatory cytokines, an effect that was reproduced by overexpressing RAC1 in normal human keratinocytes. In keratinocytes, modulating RAC1 activity altered differentiation, proliferation, and inflammatory pathways, including STAT3, NFκB, and zinc finger protein 750 (ZNF750). Finally, RAC1 inhibition in xenografts composed of human PHKCs and immunocytes abolished psoriasiform hyperplasia and inflammation in vivo. These studies implicate RAC1 as a potential therapeutic target for psoriasis and as a key orchestrator of pathologic epidermis-immune interactions.